After a long ride in my Blablacar lasting seven hours (have I ever mentioned how WIDE Spain is!? ), I finally arrived into Barcelona late at night. The driver, a really nice German surfer, was even kind enough to drop me off in front of my hostel. I fell asleep as soon I lay down in my bed. Now you’re going to notice something about this post, namely that there are pretty much no photos accompanying it! Since I had visited Barcelona before on my last Spain trip, I didn’t feel the need to be a tourist and go around all the attractions. Although I’m sure there were still plenty I didn’t get to see on my last visit. Sangrada Familia was also awesome enough that I considered re-visiting it. Instead I decided to have a break from being a tourist and spent the morning doing some much needed skyping, before heading out to a beach in Sitges recommended to me by a local. The beach wasn’t actually very impressive I thought, so I didn’t even take any photos! Arrogant I know. I just relaxed instead in the sunlight with a fro-yo. That night I watched the Space Jam movie with the rest of my hostel before an early-ish night. This marked my last day in Spain. Price: €9 in a 6 bed room! Overall: Great hostel especially for the low price! The hostel was very modern and clean with a bicycle theme. Staff were great and I will definitely stay again on my next Barcelona visit. Over the month I had been to so many places within three countries. I have definitely found the key to better travelling is to not rush things and checking out smaller towns. 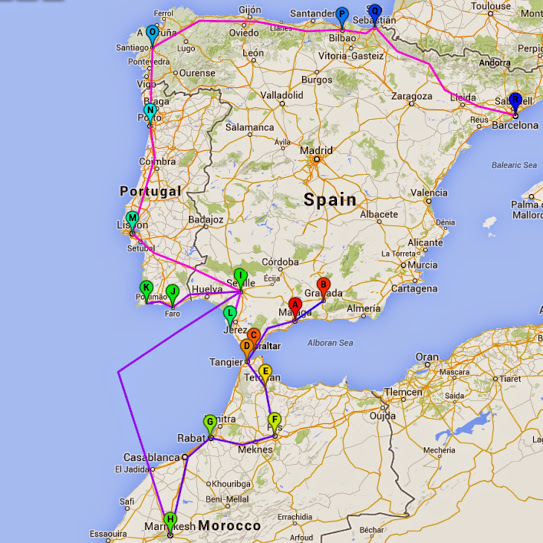 I did end up rushing the last part across North Spain with spending so much time (a whole six nights) in Sevilla. But hey sometimes you have to just live in the moment. I did love Sevilla at the the time and don’t regret extra nights there. Best moment: Listening to the wailing of the mosques from the rooftop of my Fez hostel while watching the sun set, and realising I really was in a whole different culture on the other side of the world. Really roughly done from memory, but this is all my trains, buses, blablacars and ferry. This figure works out much better than what my estimated railpass costs would have been considering my railpass wouldn’t have been valid within Morocco, cost something like $700 for just 10 days (so I would have only used 5 days for the first month which is $350 worth) not including the extra reservation fees on top for each train. I actually had 14 ‘travel days’ in total during this whole month. There are other options for other types of railpass of course like the unlimited days one which is priced at something like $1700 for couple of months. I still like my actual travel cost using mainly buses much better. Including fun things like my scuba diving (€70), the Alhambra Place in Grananda (€13), my guided Sintra day tour (€45), any meals I ate out in restaurants would usually average in price of €10, shopping for spanish boots (€35), miscellaneous costs like metro tickets, foreign transaction fees…….. etc etc it all adds up rather fast. As long as I’d been travelling for, I had been really lucky weather wise for the last month with practically no rain. The occasional overcast day but the majority had been sunny. San Sebastián was about to ruin my streak of good luck. At least the first evening was clear as I wandered around the bay, gazing at the beach and pretty sunset. Thinking of the fantastic beachy plans I had for the next two days with maybe some surfing if the water felt warm enough. At the hostel I enjoyed a surprisingly cosy evening with red wine, a crowded tiny kitchen, and a delicious cooked dinner made by one of staff using an old recipe of his ‘mama’. I awoke the next day to a heavily overcast sky with impeding rain clouds and a band playing outside in the square next to my hostel. No sleeping in for the hungover allowed. According to the forecast I still had a couple of hours until the rain was due to show so I decided to go and hike the nearby hill with a rather large Jesus statue on top. It was while I was admiring Jesus’s frown, that the sky decided to gush a million buckets of water all at once. Lucky I was wearing my rain coat unlike a few of the other tourists. Dodging cats and dogs I scurried back to my hostel to hide for a bit. I did do a little bit of naughty shopping later when the rain lightened. But hey you gotta have a highlight to the day somewhere! The next day was again fairly miserable with clouds. A chilly wind soon blew those away, but it was then too cold to think about the beach. I did enjoy a walk around the main west beach bay to see the Wind Combs. Supposedly the iron sculptures comb the wind as it enters the bay giving the city of San Sebastián good luck. Each one weighs over a ton and was apparently very fun to install. I even saw some brave kite boarders during my walk as the sun peeped out later that afternoon, but on the other San Sebastián beach. The bay located on the east side of the city generally has bigger waves and attracts more surfers. It was still too freezing cold with that chilly wind for me to even want to put a toe in the water. For lunch I stumbled upon a very delicious hot pinchos bar. It was amaze-balls with cheap prices. During this process I learned how to spot the better pincho bars. You are looking for bars that are generally dirty with lots of rubbish on the floor, which is a sign locals eat there as the Spanish like to wipe their mouths then throw their napkin on the floor. A bar with no seats and full of people, as the Spanish like to stand. Only tourists like to sit. And one that doesn’t charge you before you eat the pinchos. Any bar that breaks those guidelines is probably a tourist trap with usually old cold pinchos on display. The same guidelines apply for finding a good tapas bar in the rest of Spain. With a happy stomach I grabbed my backpack and was on my way to the meeting point for my next Blablacar ride. Overall: A really small hostel but with some of the friendliest staff I’ve ever seen. The kitchen common area was covered in thank you notes and love letters to the staff which was really nice to see. The majority exclaiming their great experience of the hostel. I think if I’d had better weather, as San Sebastián is not the most interesting place when it’s cold and rainy, then I would felt the same way.